Sistema Shyam TeleServices Limited, which owns the MTS brand, has crossed the 10 million subscribers mark in India. Sistema Shyam TeleServices Limited (SSTL), which owns the MTS brand, today said it has crossed the 10 million subscribers mark in India and to celebrate the achievement, it has come out with a new tagline, "A Step Ahead", Press Trust of India reported. "It is indeed a proud moment for me and the entire MTS team to have crossed the 10 million customers milestone," SSTL President and Chief Executive Officer Vsevolod Rozanov told. Adding to the celebrations, MTS has also launched the MTS Pulse, the company's first Android-powered Smartphone, which is designed by Taiwanese manufacturer HTC, SSTL said in a statement. According to PTI customers can get the high-end smartphone worth Rs 18,000 for free. The customer does not need to make any upfront payment for the phone, but is required to sign up for a monthly contract with a Rs 1,500 rental charge and a lock-in period of 12 months, based on which the customer would get the smartphone for free. Additionally, the customer would get 1,500 minutes, 1,500 SMSes and 1,500 MB of data usage every month for 12 months, the company said in a statement. "We are excited to unveil the new MTS brand, in line with MTS' global strategy," SSTL Chief Marketing Officer Leonid Musatov told reporters. At present, the company's network facilitates coverage of 85 per cent of subscribers in the country and over 92% of the data services potential. 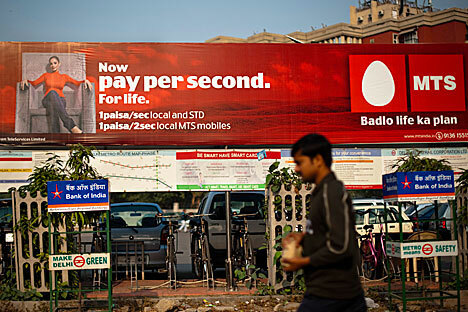 MTS has to its credit over 5 lakh mobile broadband customers in over 130 towns across India, PTI said.